How to visit Milan in one day, without losing any of the top places to see and things to do. An easy Milan walking itinerary to discover Italy new top destination highlights at your own pace. Why should you spend one day in Milan? You probably didn’t plan so far to visit the second town of Italy. Once an industrial pole, Milan was usually not included in mainstream tourist itineraries. However, things have changed. The universal exhibition Expo Milano 2015 has driven over 20 million visitors to Milan, and has made this town one of Europe key destinations in 2015 and beyond. On top of this, Milan is a vibrant city, rich of cultural events, artistic masterpieces, design and fashion shopping and great food. One day in Milan would make absolute sense in your Italian itinerary, and you may actually consider spending a night in Milan and enjoy its restaurants and night life. In case you are looking for a great place to stay, have a look at my page: where to stay in Milan: the best 3 and 4 stars hotels. Even if you don’t have time to sleep there, you may likely pass through its airport or its station, so why not spending one day in Milan? In case you decide to do so, here is a (pretty extensive!) walking itinerary, designed to cover in one day Milan main highlights (click on the image to use the interactive Google map). Too tired to discover Milan by foot? Then get an Hop on and off bus and enjoy Milan with an open-top double decker bus . Click here to know more! Start your Milan in one day walking tour in Piazza del Duomo, with a Cappuccino. Best place: the food hall on top of Rinascente department store, for breathtaking views of Duomo’s spires. Visit the Duomo cathedral, the third largest Gothic cathedral in the world, to admire the intricate architecture of statues, spires and gargoyles. Don’t forget to climb up to the terrace (lifts on the left side of the cathedral) for an up-close view of the 3,600 statues and 135 spires and a closer view of the famous gilded copper ‘Madonnina’ atop the tallest spike. The entrance in on the left side of the cathedral. The Duomo and its roof top are iconic destination in Milan, and waiting times to visit them may be very long. I strongly suggest you purchase your Duomo ticket in advance to skip the queue. Click here to get them online! From Duomo square cross the majestic glass-roofed Galleria Vittorio Emanuele II (one of the world’s most glamorous and oldest shopping malls – it was built in 1867) and get to Piazza della Scala, where you can see the world’s most famous opera house. For a typical snack, grab a “Panzerotto” (delicious fried pastry triangle stuffed with tomato and oozing mozzarella) at Luini (via Santa Radegonda 16, just behind Rinascente). From Piazza della Scala, take Via Manzoni. There you will find the Poldi Pezzoli Museum, which displays works of art by Michelangelo, Botticelli, Piero della Francesca, Perugino, Pinturicchio and the famous “Lady Portrait” by Pollaiolo, the symbol of the museum (worth a visit if you have enough time). Keep on walking in via Manzoni, than turn right in via Montenapoleone. This is the posh area, with all the main fashion boutiques. Just wander around the Milan Fashion District (via Montenapoleone, via Sant’Andrea and via della Spiga), enjoying the Quadrilatero della Moda (“Golden Rectangle”), then go back to piazza del Duomo by Corso Vittorio Emanuele (large pedestrian avenue, stuffed with cafés, eateries and fashion boutiques). 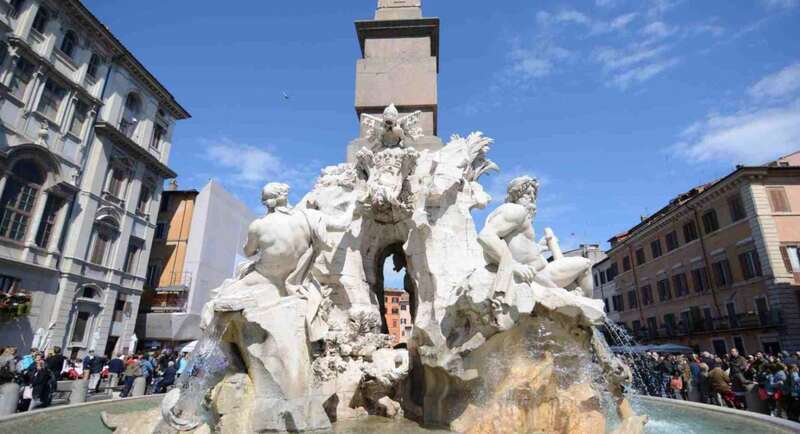 From Piazza del Duomo, make a small detour to visit the delightful San Satiro church, featuring a breathtaking trompe l’oeuil from Bramante, and the nearby Peck shop, the temple of high end Italian food and wine. If you enjoy walking, you can continue down via Torino to visit San Lorenzo and then Sant’Ambrogio, two of the oldest and most important churches of Milan, dating from the Roman times. Otherwise, take the “red” underground in Piazza duomo, to visit Santa Maria delle Grazie and the Last Supper from Leonardo da Vinci, undoubtedly Milan’s best-known attraction after the Duomo. Leonardo last Supper Fresco is very delicate, and the number of persons that are allowed to visit it in one day is limited. For this reason, advance reservation for the last supper are a must and it’s nearly impossible to find tickets the same day of the visit. To purchase your online ticket click here. After visiting the church (don’t forget the beautiful cloister), walk to Castello Sforzesco, the imposing castle built by the Duke of Milan, Gian Galeazzo Visconti, in 1358. In the Castle museum you can admire Michelangelo’s last unfinished masterpiece, the Pietà Rondanini. The large park behind it (“parco Sempione”) is an excellent place to rest. From Castello Sforzesco walk to the Brera district, and enjoy its bohemian feel. Wander around the old cobble stone streets, rich of antiques shops and art galleries. While you’re there, visit the Pinacoteca di Brera gallery to see the impressive collection of masterpieces by Raphael, Piero della Francesca and Andrea Mantegna. The last part of this itinerary walks you from Brera to the new Porta Nuova area. You can have a stop at the Eataly store and restaurants at Porta Garibaldi, for a bonanza of Italian food and / or have an aperitivo in Corso Como at 10 Corso Como, a whimsical fashion and design emporium – posh but expensive, you can get inside and have a look at it for free anyway – it hosts a bar, a restaurant, a boutique, a book shop and an art gallery. End your tour at the new Unicredit Tower, which skyscraper is the new symbol of Milan, and enjoy the evening life at the pedestrian Gae Aulenti square (click here to read my post about it). Enjoy your one day itinerary in Milan! Milan can provide you with all kind of great experiences! Click here to check your many options, from guided tours to shopping, food experiences and more! Milan was a delicious surprise for me. Had a great time there. Great day tour for Milan! The map is especially helpful! Approx. how many hours/how much of the day would this take up? I know that how much time you spend at each place would change the time, but ballpark? Oh my gosh only a couple hours?? I was expecting like 5 or 6hrs this is perfect, thank you! Milan is amazing and this post is really well done!